el-Wad point from the Early Upper Paleolithic site of Mughr el-Hamamah, Jordan (Stutz et al., in press). 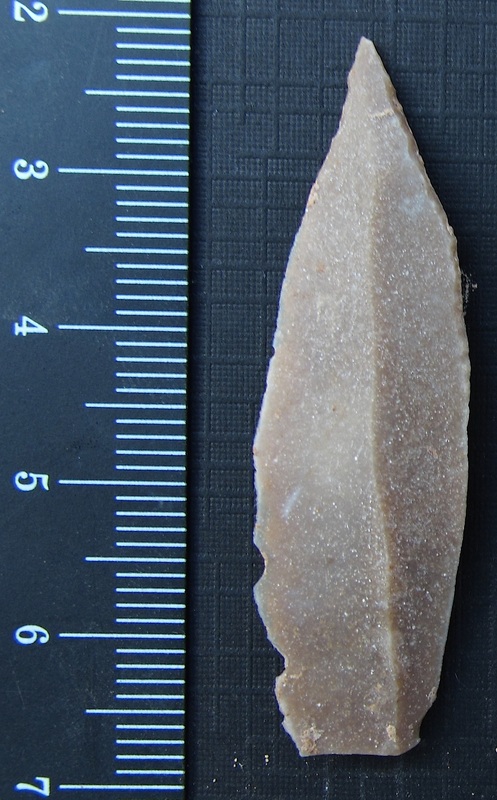 The stone tools from Mughr el-Hamamah date to between 45 and 39 thousand years ago, including some Protoaurignacian-like technologies employed side by side with Levallois point production and expedient flake and bladelet production technologies. Photograph by Aaron Jonas Stutz CC-BY 2015. We’re now paying particular attention to research on the Protoaurignacian, including the notable recent report by Benazzi et al. (2015). We’ll get to their report below. Let’s start with the Protoaurignacian fuss in the first place. There’s pretty good scientific reason for it. Around 2006, Paul Mellars and João Zilhão–two prehistoric archaeologists who otherwise don’t agree about much–separately presented very similar suggestions, which have turned out to be very influential. In a series papers they separately argued that the Protoaurignacian archaeological artifact pattern–or technocomplex, which I will describe in a bit more detail below–has a clear relationship to anatomically modern human expansion into western Eurasia around 40,000 years ago. Mellars (2006) suggested that the Protoaurignacian artifact pattern is actually a key component of a complex archaeological marker that traces anatomically modern human colonization of western Eurasia … and thus, also of Neandertal extinction. Zilhão (2006) argued the same thing about anatomically modern humans, but he suggested that anatomically distinctive Neandertals–as opposed to some Neandertal features inherited by some Early Upper Paleolithic people with mainly anatomically modern ancestry–persisted in parts of Europe until ca. 30,000 years ago. On the one hand, there’s no clear threshold of how many unique derived Neandertal traits you need to be “distinctively Neandertal.” On the other, Zilhão and others pointed out that in Iberia, there are some quite distinctively Neandertal fossils, for which a series of radiocarbon dates had placed at roughly 30 kya. The problem now is that those C14 dates were made on incompletely chemically cleaned and filtered collagen-like material surviving in those bones (Wood et al., 2013, 2014). It turns out that all of the Iberian Neandertals so far re-analyzed with the collagen ultrafiltration pretreatment are actually closer to 50-45 kya in age, associated with Middle Paleolithic stone tools. Human adaptation and niche alike are defined in major part by technology. We use our bodies to shape and transform our material surroundings, fundamentally to extract food resources, but often to create things that we then utilize with our bodies to shape other things, including our own bodies. Technology really changes the way our bodies intertwine with and experience the environment. 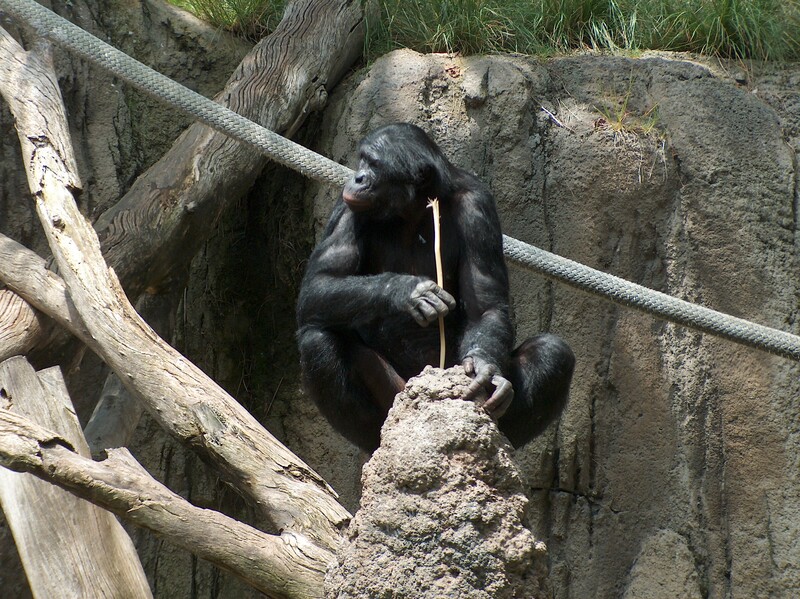 Bonobo using a stick as a fishing tool to extract termites in the San Diego Zoo. Photograph by Wikipedia user TacoDeposit, licensed under a CC-BY-SA 3.0 license. 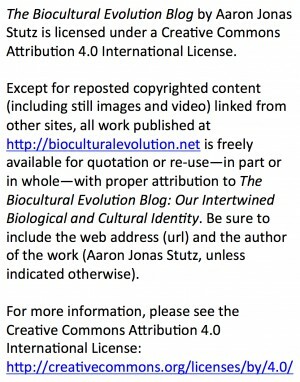 It is reshared here under a CC-BY-SA 4.0 International License, acknowledging TacoDeposit’s authorship. The Oase 1 mandible, with some conspicuous anatomically modern human features, like the well-defined mental trigone (i.e. the chin). Along with the Ust-‘Ishim femur (Fu et al., 2015), Oase 1 is the only western Eurasian hominin fossil with anatomically modern features whose surviving bone tissues have been directly dated with the important collagen-ultrafiltration C14 protocol, yielding a likely age older than 39 thousand years. Like the Ust-‘Ishim femur (ca. 45 ky old), the Oase 1 mandible was an isolated find, with no associated archaeological artifacts. Recent reports indicate that ancient bits of DNA from Oase 1 reveal it had a great-great or great-great-great grandparent who was a Neandertal (Callaway, 2015; Gibbons, 2015). Photograph of Oase 1 from Trinkaus et al. (2003). Every single one of us on Earth today is, by definition, an anatomically modern human. We differ a lot from the Neandertal anatomical pattern that–despite variations among individuals–generally prevailed across western Eurasia some 50,000 years ago. It stands to reason that it would have taken some time for evolution to have shaped the anatomical features that we all now share. It’s reasonable to expect that, going back well into the last Ice Age–which ended 12,000 or so years ago–our ancestors would have also been anatomically modern human, not Neandertal. Are We in Equilibrium with Our Niche? Are We in Equilibrium with the Wider Ecosystem? 1) Are human beings today in equilibrium with our niche? 2) Are human beings–and the niche we occupy–in equilibrium with the wider ecosystem? Castle in the Air. M.C. 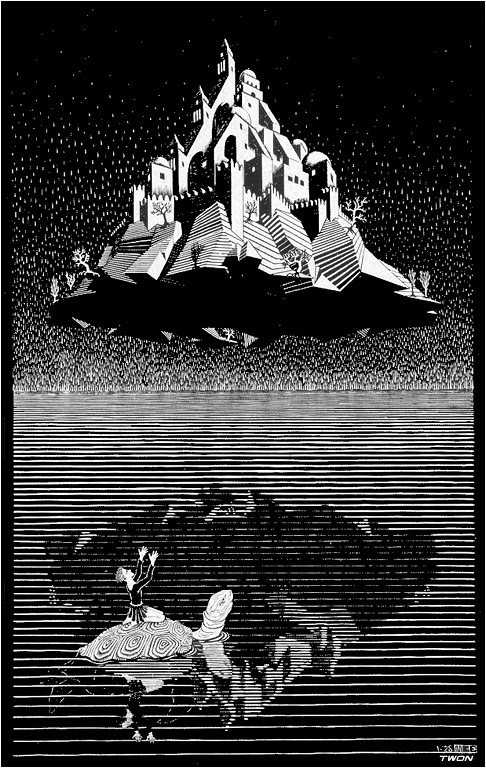 Escher (1928). We’ll have to wait for another question that these inevitably beg: what is the human niche, anyway, even if you can define it? So, hang on a moment. These questions about equilibrium were important for my beginning undergraduate students to tackle. This is in part because it is important to develop awareness of how–and therefore, why–we’re integrally part of a globally intertwined biosphere. The resilience of the entire biosphere now depends in no small part on the actions that humans take. But even more basically, with these two questions, there are no foregone conclusions. Sure, it’s clear that something’s out of wack with our relationship to the wider planetary system of which we’re part. Yet, it’s not clear exactly when, how, or why the human-environment relationship has gotten out of wack. Nor is it clear what we can do about it. Thus, what I can tell my students is this. There’s substantial evidence pointing toward a wrong answer that many climate-science-deniers cling to. We’re not in the middle of a natural climatic fluctuation, like the so-called Little Ice Age that lasted from the 14th to the 19th Centuries. But I can’t even begin to tell my students what the right answer is, because interdisciplinary scientific inquiry into sustainability and complex-system resilience is still very much maturing.